Pushkin’s famous novel was translated by Tchaikovsky into soaring emotions in his opera Eugene Onegin, and this production in the hands of Russian conductor Valery Gergiev and Russian soprano Anna Netrebko is pure magic. Netrebko’s letter scene in Scene 2 alone is worth the price of the admission, as the young Tatiana pours out the wild feelings Onegin has ignited in her. The story tells of a country girl who falls passionately in love with the suave friend of her coquettish sister’s beloved, a poet. The shy teenager spends a long night writing down her newly awakened feelings and sends the letter to Onegin, who gently tells her he cannot return her love, or be bound by the chains of domesticity. A fight later ensues between the two men when Onegin flirts with her sister Olga, and the poet is killed in a duel. Years later Onegin returns to St Petersburg to find Tatiana now a married society belle, and he tries unsuccessfully to capture her heart. It’s not surprising that this opera has been a favourite with Russian audiences since its 1879 premiere. The music is glorious and rich, filled with wonderful arias that showcase all of these Slavic singers. The two younger male leads are both Polish and the prince, Tatiana’s husband, is powerfully sung by Russian bass Alexei Tanovitski, who only has moments on stage to convey this older man’s fine character. Mariusz Kwiecień as Onegin reprises a role he has sung often before, but in this reading he is less arrogant than many, and the scene where he rejects her love is done without callousness, but rather tender regret. Piotr Beczała plays the poet Lenski with an endearing charm, contrasting well with Oksana Volkova’s vivacious Olga. The scene where he foresees his own death is very moving. 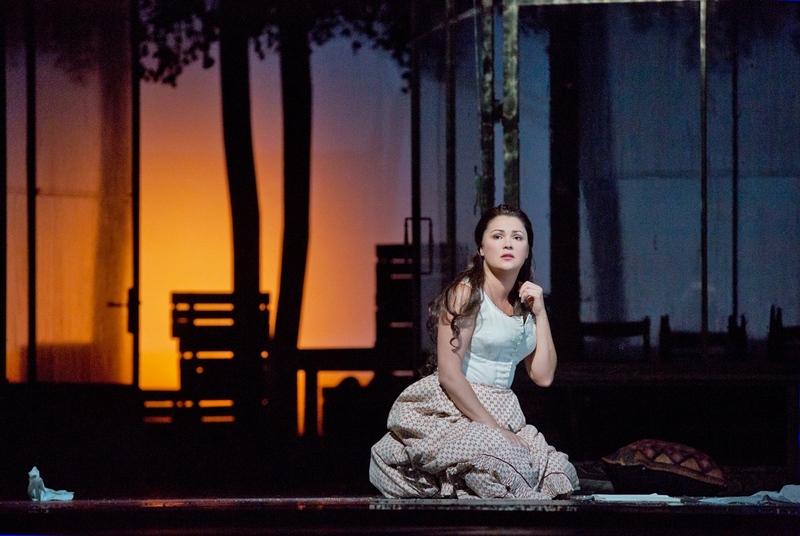 The amazing Anna Netrebko is the star of the show, taking Tatiana from the hesitant stirrings in her heart to the elegant and adored wife, who now turns her back on the passion for which she once yearned. It is obvious that this is a character deeply rooted in the singer’s background and we experience the anguish as Tatiana chooses duty over love. A nuanced reading of all the characters brings the turmoil of their lives to the fore. Ensemble scenes dazzle with a gorgeously costumed chorus. The staging is at times clunky though, with long intervals while the rather boring set gets changed. This drags the total length of the opera to almost four hours, but the stars are of such amazing quality that one is lost in the beauty of the music.